Current construction activity at Fredrikstad site. 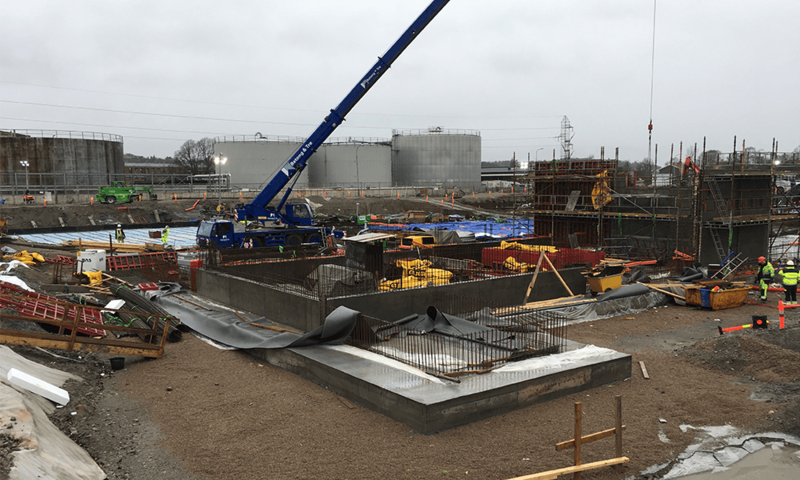 While phase 1 construction for 2000 tons capacity for salmon and a slaughtering facility are in progress in Fredrikstad, engineering is now on a fast track for development for the adjacent 16,000 m2 landsite. Phase 2 expansion will involve the addition of 4200 tons new production capacity and a smolt facility. Construction of phase 2 is set to start in 2018, pending permits, and will be based on a new generation of designs, developed to achieve optimal capital efficiency and fish welfare. A range of new innovations will be implemented to improve the performance of the land-based production method on a true industrial scale. The phase 2 facility is a pilot for the next expansion projects planned by Nordic Aquafarms.